Dallas Aurora 2011 was a huge success! 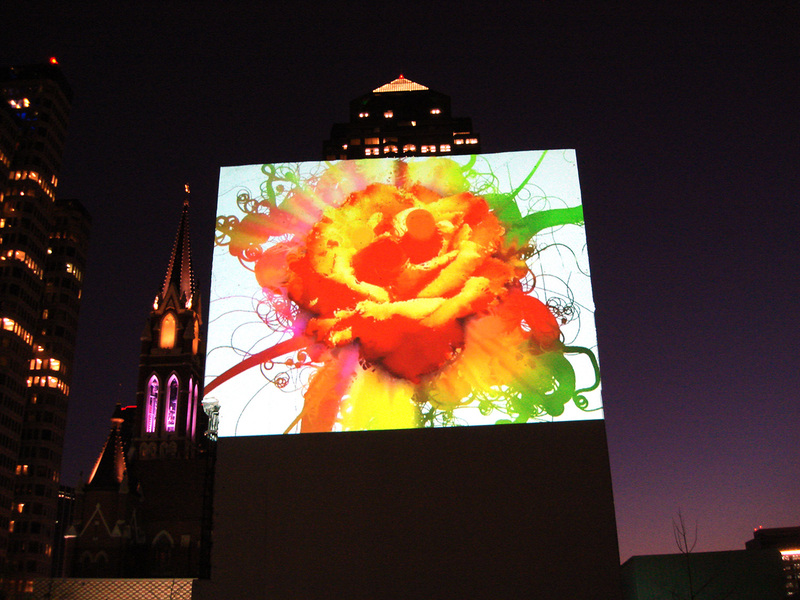 “Flowers and Tendrils” as well as “Bombshell” were installed on the roof of the parking garage across from the Winspear on Friday 10/28/2011 as part of the Aurora Dallas 2011 video and art festival. I have been to several similar festivals at this point and Aurora Dallas was the best overall experience I have had so far both from an artist perspective as well as from a spectator perspective! The expansive outdoor art experience sprawled across several city blocks along Flora Street in the Downtown Arts district. It featured a hundred artists with a diverse body of work. Everything from simple video projections to highly interactive and sensory immersive experiences. I was very impressed with the thought that went into many of the interactive pieces and the consideration given to kids and their participation in the art. Aurora Dallas was the most fun my family and kids have had at an art festival by far! Aurora Dallas 2011 was very well organized and came together well mostly due to the hard work and planning of the organizers. Everything down to the power requirements were figured out ahead of time. The Crowds were pleasant and well behaved and the art installations were both thought provoking and family friendly. One of the organizers who put a lot of time in on this event was Joshua King, his installation Transition of Life, was also one of my favorites as well as my kids favorites. I took a lot of pictures and video but it was dark and not all of them turned out very well, however some did turn out and I have put them in a Flickr set you can access below.